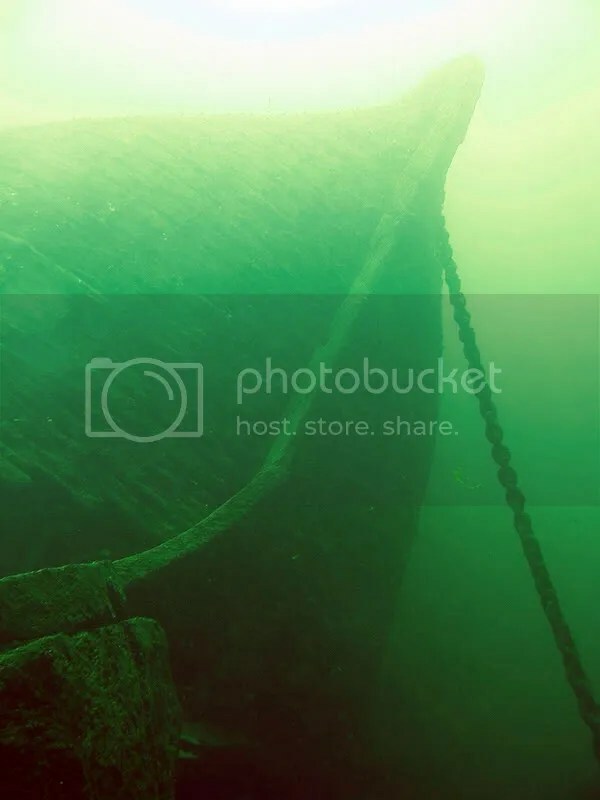 This past weekend I headed up to Salem, MA with Bill to do some wreck diving aboard the Gauntlet. Weather was damn near perfect with flat calm seas both days and comfortable surface temperatures. 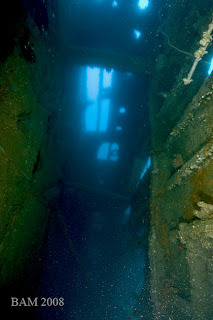 Saturday we hit the wreck of the PINTHIS, a turtled tanker in 100 fsw. Dropping down to the wreck it was nice to see the upside down hull stretching into the distance in the 30 feet of bright visibility. We were moored into the anchor of the wreck which has fallen out of the hull but was still in the hawsepipe. We started aft and dropped into one of the easy openings that give access to the relatively wide open interior. 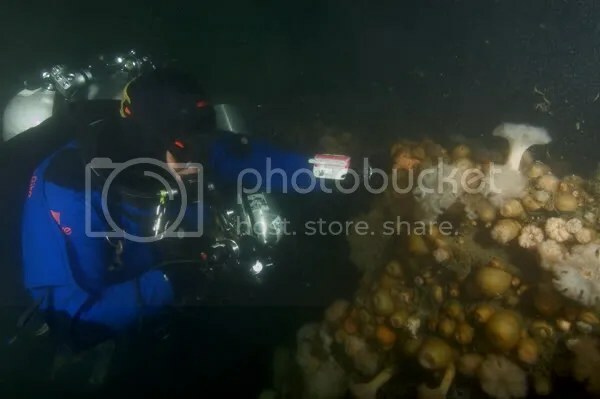 After poking around a bit we exited the wreck and headed towards the stern popping in and out the wreck along the way enjoying the great conditions. The bottom here was sandy and rocky with lots of interesting starfish we don’t usually see down here further south. Beautiful purple and red and white starfish speckled the rocky sea floor making me wish for a second that I had the proper lens and knew anything about macro photography. Back at the bow I was packing up to head up when I hear “wow look at that.” I turned around and found Bill giggling through his DSV checking out a rather large wolf fish under some wreckage. Sunday we headed out in more overcast but equally pleasant conditions with the flat seas from Saturday still hanging around. Today the destination was the “Bone wreck” in 180 fsw. A large wooden wreck that gets its name from the whale bones that litter the site. Heading down the line it got dark pretty fast and the visibility seemed to drop the further down the line we got. I kept an eye on my gauges to anticipate when to expect the wreck to avoid crashing into it. Upon arrival the conditions were not terrible with 10 feet or so of very dark visibility. 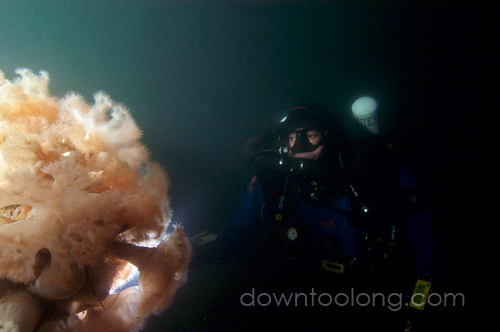 It seemed everything was blanketed with beautiful anemones and it felt like we were exploring a hidden garden. We first hit the bow, which looks more like a Big Top than the pointy end of a ship at this point. Lots of derelict fishing nets with ropes and lines hanging all over dictated we use extra caution. Once we got oriented we headed aft and came across several partially buried whale vertebrae. With the water around 40 degrees and a chilly deco ahead we cut the dive at 25 minutes and headed up. 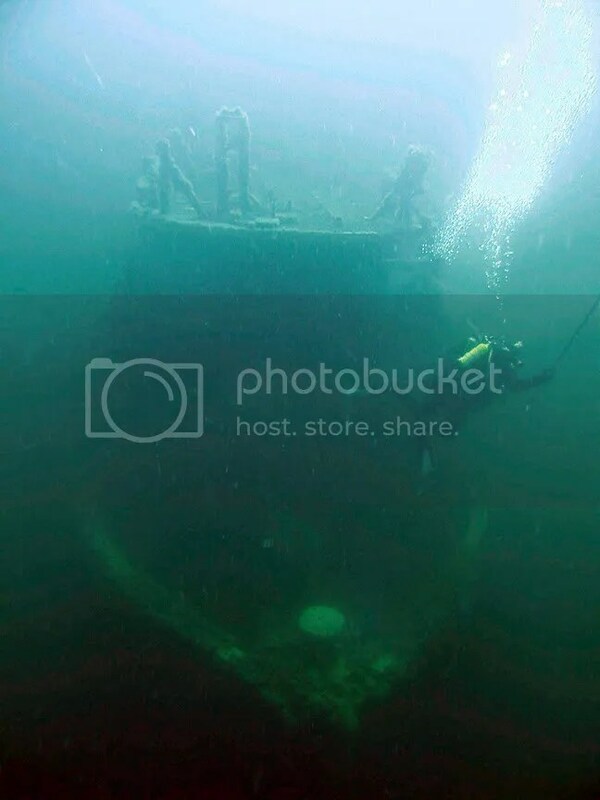 Overall an awesome weekend of diving some spectacular wrecks with near perfect spring weather! do you have to pay him a modeling fee?